Epcot will celebrate its 30th anniversary in a little less than a month. We’re going to be looking at the history of the park, originally known as EPCOT Center, over the next several weeks in anticipation of the occasion. To start out we’re going to explore this blueprint of the park, or planned park, in 1981. First things first, beyond the original names of the pavilions being posted, there are two that you may not recognize. In case the layout seems unfamiliar, Futureprobe was one of the first designations for the attraction better known as Horizons. The other that may mystify is Transarama 2000. This is obviously World of Motion, but I have to admit that this name is a new one even for me. As far as I knew, World of Motion had always been World of Motion. Elsewhere around Future World, you can see the layout for The Living Seas, even though it wouldn’t open until 1986. There are also plots set aside for three other future pavilions. 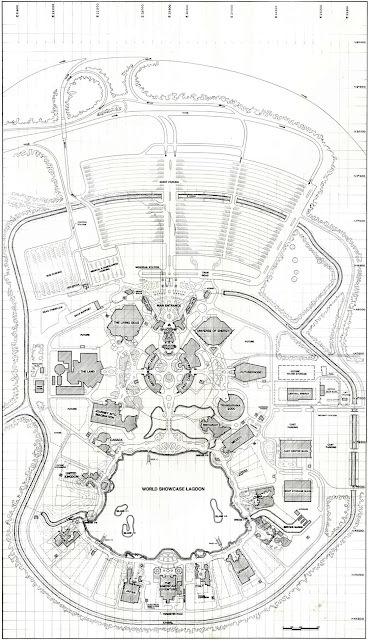 One would become the Wonders of Life pavilion, now the festival center for Flower & Garden and Food & Wine events, while another would be tapped as part of The Land’s expansion when Soarin’ came to town in 2005. The space between The Land and The Living Seas has never been developed for guest experiences. Some of you have heard me discuss the dichotomy between Future World East and Future World West. That is, how the natural, flowing sciences of Future World West are characterized by the movement of water, asymmetrical plant life, and the circular, smooth planters and walkways of the area. Meanwhile, hard angles, sharper plants, and no water in sight are representative of hard sciences found in Future World East. If you need a better vantage point, this blueprint gives you all the exploration you need! Moving on to World Showcase, the never-built pavilion of Africa sits where we now have only the Refreshment Outpost is now. Also, Italy has an outline slated for Future Expansion. What was meant to be a boat ride through Italy would, over 25 years later, bring down the back wall of the pavilion and become a the restaurant, Via Napoli. There were nine plots measured out for future pavilions around the World Showcase Promenade. Six have never been utilized for pavilions. Of the three that have been developed, one would become Morocco in 1984, a second became Norway in 1988, and 1990 welcomed Epcot’s second gate, the International Gateway. The map is tantalizing mixture of past and dreams for the future with a dash of design. With everything from traffic flows, planters, parking areas, and behind the scenes structures, I couldn’t help but making sure I shared this with all of you. What corner of this Epcot entices you the most or sets your memories in motion? This certainly makes my heart ache -- again -- for Horizons (I'm sure glad they dropped the name "Futureprobe!" When I visited Epcot, I had no idea about the division of Future World's layout into "hard" and "soft" sciences. Reading your posts and listening to podcasts opened my eyes to this detail, and I can't wait to view it all again. I don't quite see how water elements would not be considered part of the "hard" science landscape (they could certainly be presented with a more structured style), but I guess their absence there really does help separate the two sides.